Students in the Musical Theater minor at St. Edward’s University sing, dance and immerse themselves in the world of theater. Learn musicianship and musical theater. Explore music through courses such as piano, voice or by joining a musical group on campus. Hone your dancing skills in ballet, tap or musical theater dance. This minor requires 18 hours of coursework. Work with and learn from professional musicians and musical theatre artists. St. Edward's students may participate in a theater program which has a relationship with the Actors' Equity, the union of professional actors and stage managers in the United States. This is an incredible chance to build your career. St. Edward’s University is home to one of only undergraduate-only theater training programs producing a full season under an Actors' Equity Association agreement. Through the Mary Moody Northen Theatre, students collaborate and perform with professionals as they expand their networks and grow as artists and performers. Recent musical theatre directors include Nick Mayo, Danny Herman and Robert Westenberg. Mary Moody Northen Theater (MMNT) stands at the center of the theater training program and operates on a professional model. Through MMNT, students work and perform alongside professionals in the field and may earn points towards membership in Actors' Equity Association, the union of professional actors and stage managers in the United States. MMNT produces at least one musical each season. For more information on MMNT, including reviews of past musical productions, follow this link. You will have unique opportunities in the cosmopolitan city of Austin, Texas, known as "The Live Music Capital of the World." With major events like Austin City Limits and South by Southwest, more than 200 live music venues, and 1,650 music-related businesses, Austin is the place to be if you're interested in music and performance. You’ll find nearly endless opportunity for artistic expression through St. Edward’s University and the surrounding community. This student-led organization provides multiple opportunities for involvement in theater production in addition to the university's main stage and class-related productions. Students can join any of the university's many musical groups to practice, perform, and collaborate with like-minded peers. Students have the opportunity to take part in a variety of musical genres, including choral music, classical music, chamber music, mariachi, orchestra, guitar, jazz, and opera. 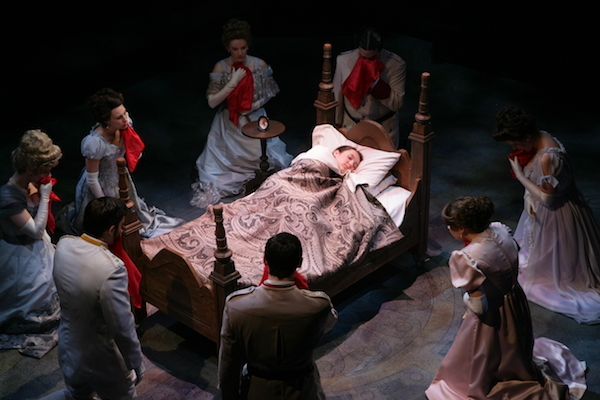 The faculty of the Theater Arts program at St. Edward's University is invested in the professional and personal development of their students. They come from diverse backgrounds and bring a depth of experience to their teaching. The Musical Theater program faculty members also have experience working on tour, in movies, and on TV.